Earn points with every purchase and receive discounts on future orders. It's simple: £10 in purchases earns you 1 advantage points. An order for £50 will earn you 5 advantage points. What are the advantages of this loyalty program? Your purchases earn you discounts. 100 advantage points give you a 10%) discount. 100 accumulated points can be exchanged for a 10% discount. With each order, the number of advantage points you'll receive is displayed at checkout. These points will be awarded to your account once payment is confirmed. Aquired points are calculated from the total order amount VAT included, excluding shipping costs. 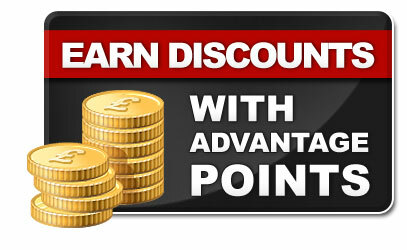 Once you have earned enough points for a discount, you'll be informed by email. To view your accumulated points, sign-in and open the "My Account" page. You've earned a discount, now how do you use it? …your discount will automatically be deducted from the total amount of your order (excluding shipping). Who can earn loyalty points ? Canceled orders and orders using redeemed rewards do not accumulate advantage points. An order using redeemed rewards cannot be combined with other discounts. Your points are valid for one year from the time of your last order on our site. Listers Timber & Builders Merchants reserves the right to modify the terms and conditions of the loyalty program at any time.